Hot cross buns. We get very excited about these each year and for good reason. If you buy good quality ones they are amazing! If you don’t you’re buying all sorts of nasties, sulphites, palm oil, preservatives, a bucket load of refined sugar all masked as a friendly Easter treat. So how does one make hot cross buns with no nasties? It’s surprisingly easy…and very cheap! 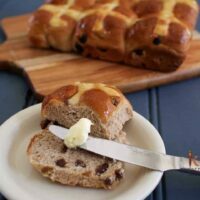 Hot cross buns have become a real contentious issue this Easter (see this post from Alisa at 123 Nourish Me) and I get why. But to get the best from the season, you need to be making your own. They are so much yummier and fill your whole house with the delicious smell of the spices in the buns. Now don’t get me wrong, these take a while to make, but almost 50 minutes of the prep time is hands off, so it’s not labour intensive. And making 12 means you’ve got enough for a few days. Don’t be scared off by yeast either, these are pretty much no fail! Every time I go to the bakery that I get our hot cross buns from they ask “traditional or choc chip”? And because my daughter doesn’t know about the choc chip ones…I’m never telling her. Master 3 won’t even touch them…I bet he would with choc chips though. 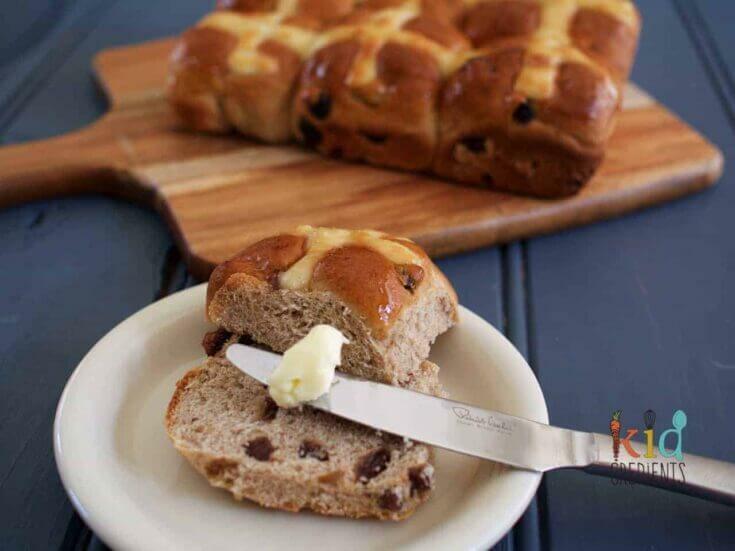 Hot cross buns are a breakfast food at Kidgredients in the lead up to Easter…and once you start chocolate for breakfast…so I’m not going there, but I’ll put it in the recipe for you! 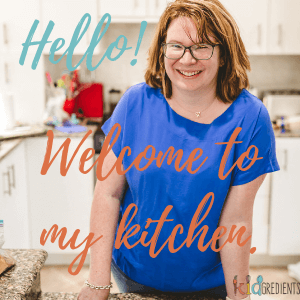 Delicious freezable, kidfriendly hot cross buns with no nasties! The best way to celebrate Easter. Freezable and scrummy...I dare you to just eat one! using a dough hook on your mixer (or do it by hand), knead for 1 minute on low. Add the sultanas and knead for 3 minutes on medium. Love home made hot cross buns! Made a chocolate batch the other day and my kids said they preferred the traditional ones! Definitely breakfast food here too!